In 1999 I formed HardArt groop to perform my music. 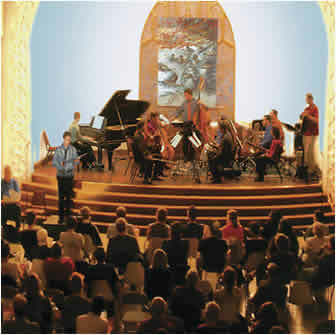 Utilizing an evolving assembly of players, the group has performed at the Museum of Contemporary Art, Chicago’s Pritzker Pavilion, the Green Mill, the Chopin Theater, Northeastern Illinois University. The name for the group arose simply from wanting to have horns but thinking that John Elmquist’s Horn Group sounded a little mundane, so I thought about the Horn & Hardart automat and decided to use the Hardart part. John Elmquist received his DMA in composition from the University of Memphis where he studied with Don Freund, and his MM in piano performance from Virginia Commonwealth University where he studied with Landon Bilyeu. He serves on the faculties the Chicago High School of the Arts, the Merit School of Music and the People’s Music School. He is also the Music Director at Ebenezer Lutheran Church in Chicago and works in and around Chicago as a bass player. In January, 2011, he won first prize in the Rapido! composition competition held by the Atlanta Chamber players, receiving a commission to be performed in the 2011-12 seasons of the Atlanta Chamber Players, Boston Musica Viva and Chicago’s Fifth House Ensemble. Also in 2011 he held a fellowship at Georgia’s Hambidge Creative Residency Program. In 2007 he received an Individual Artist Grant from the Illinois Arts Council.